For our Sunday night dinner I made linguine with garlic olive oil, garlic, sauteed scapes, and broccoli, collard greens, and a big old salad with grape tomatoes, avocado, and mushrooms. 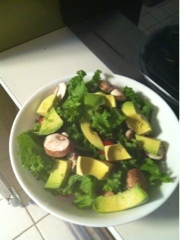 Big salad - made with mustard greens - whoops! Since I'm still coming down off of my juice cleanse, I couldn't eat the pasta. But my boyfriend said it was good. I did have the salad. If you can call it a salad. I'm a bad vegetarian and don't know my greens all that well, so when I was cleaning what I thought was lettuce for my salad...it was actually mustard greens. FAIL. We were able to tall right away that the greenery masquerading as lettuce wasn't really lettuce because it was more chewy and it tasted like mustard. This wouldn't be my first choice for greens to use in a salad, but it did give it an interesting zing. I did get to try out the collard greens. Like I said, I'm a bad vegetarian and I don't know what to do with greens so I googled a recipe for vegan collard greens. I'd honestly never had them so I didn't know what to expect. But I think they turned out pretty well. To me, they tasted like stuffed cabbage (which I love) and my boyfriend thought they tasted like the inside of a stuffed pepper. I was a bigger fan of them than he was, but I do plan on trying to make these again. If you try out this recipe, be forewarned that your house will smell like cabbage for awhile. Reminds me of walking through an apartment building or a nursing home. 1. Wash the greens well, submerging in a sink full of cold water to remove any dirt and grit. 3. Cut off the stems right where the leaf starts. Stack about 5-8 leaves on top of each other, then roll lengthwise. 4. Cut rolled up leaves into 1" slices widthwise. Repeat until all the greens are cut into strips and then put in a large pot. 6. Cover and bring to a boil over high heat, then reduce heat to a simmer. 7. Simmer for at least 45 minutes or until greens are extremely tender. Serve hot, using a slotted spoon to drain the liquid from the greens. 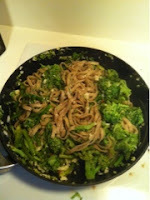 Some notes on this recipe...I cooked the greens for over an hour and they were still kind of tough. The rest of my food was ready or I might have waited longer to eat them. The apple cider vinegar smell was overpowering at first but you couldn't really taste it. Also, it seemed like I was using a heck of a lot of onion, but you couldn't taste them all that much, honestly. 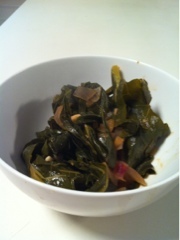 Do you have a favorite way to use collard greens? Share your suggestions in the comments, because I know I'm going to be getting a lot more of them from my CSA this summer!